Once again we headed to Winslow, Az for the 22nd Just Cruis’n Car Show, hosted by the Just Cruis’n Car Club. I believe that they had a record turnout for this year’s show with 194 entries, in spite of the poor turn out of our club. We only had 5 cars registered this year, it has been a long time since we had that small of a showing in the 22 yrs we have been supporting this show. Those of us who made the trip were Tom & Val Altgilbers, Page & Linda Barnes, Steve & Terri Besore, Steve & Cindy Bryant and Michelle & I. The Barnes & Bryants drove up on Friday via Payson. Steve & Terri and Michelle & I made the trip down I40 from Show Low. Tom & Val drove up I17 to I40 which proved to be fateful. Just outside of Winona they ran into a major storm cell, with heavy rain, little visibility and high winds. Their truck hydroplaned and did a 180 and slammed the guard rail several times, as luck would have it there was a Highway Patrol officer behind them who put on his lights which prevented major pileup. Thankfully, both Tom & Val were not hurt, their beautiful truck suffered major damage which hopefully can be repaired. Former club members, Manfred & Connie Wagner brought their pair of 1939 Chevys which were a solid hit with everyone. Brent & Sharon Haines drove Connie’s sedan. Manfred had the coupe in his enclosed trailer which he was towing with his diesel pickup. They had stopped for lunch in Payson. When they went to leave, the truck would not start, the fuel filter had collapsed and cut off the fuel supply. After some running around, they were able find a filter and get back on the road again. We did the Poker Run Friday afternoon and I think we had the backend of the storm that hit Tom & Val. Everyone took the rain in stride, and the run was completed. Steve & Terri Besore got the 2nd best hand with two pair, Kings over Queens which was good for $300. Of course we had our typical nothing hand, a lousy pair of 8’s. The show on Saturday, was great. The weather was fine, clear and bright, with some clouds. There were several new cars to look at and photograph this year. Parked next to us was a 1966 Dodge Dart rear engined Funny Car. It is a very accurate reproduction of the Lil Ole Whine Marker that was campaigned in the mid 60s. The original car was built in Phoenix and ran out of Bee Line Dragway. I remember seeing the car run at Lions and Irwindale. It hooked up quite well and was very competitive, it was great to hear it run again! Also catching my eye, was a 1940 Ford Deluxe convertible which was done in a somewhat 1950s style custom. It gave me a few new ideas to incorporate into my build. 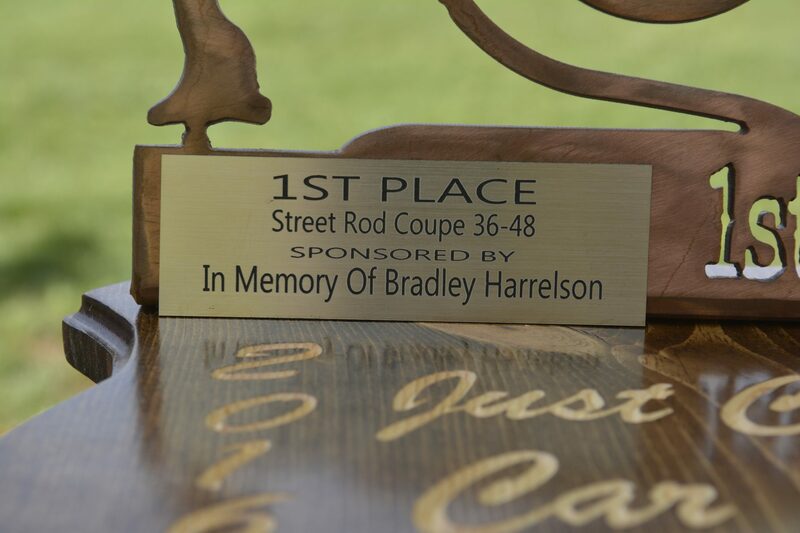 The award for Best of Class 1936-48 Street Rod Coupe was given in honor of OTHG-Phoenix member Bradley Harrelson who unfortunately passed away earlier this year. Brad was well loved by the Just Cruis’n Car Club. In the past 22 years Brad only missed one show, last year’s when he was in hospital dealing with gallstone surgery. Brad was instrumental in getting the Over The Hill Gang Phoenix involved and supporting the show. This was a very touching and considerate thing to do on the part of the Just Cruis’n Car Club. It was very fitting that Manfred Wagner received this award. Manfred and Brad were old friends long before they relocated to Phoenix and Brad loved Manfred’s beautiful 1939 Chevy Coupe. Steve Besore picked up a Best in Class and one of the three club pick custom trophies. Page Barnes, Steve Bryant and I all won class awards. Manfred and Connie, as usual ran the table, each picked up a Best in Class, Manfred got Best Interior and Connie got Best of Show. Another great Winslow show now in the books, each year it gets better. Already looking forward to next year! Next stop, Goodguys at Westworld! Hoping to see everyone there!